After Mugabe, Zimbabwe Still Enforces A Law Against Insulting The President Under rules inherited from British colonial times, jokes, slurs or accusations against the head of state are unlawful. An "insult" carries a hefty fine and a brief jail sentence. After 37 years of autocratic rule under Robert Mugabe, President Emmerson Mnangagwa promised a democratic era for Zimbabwe. But his government penalizes criticism. 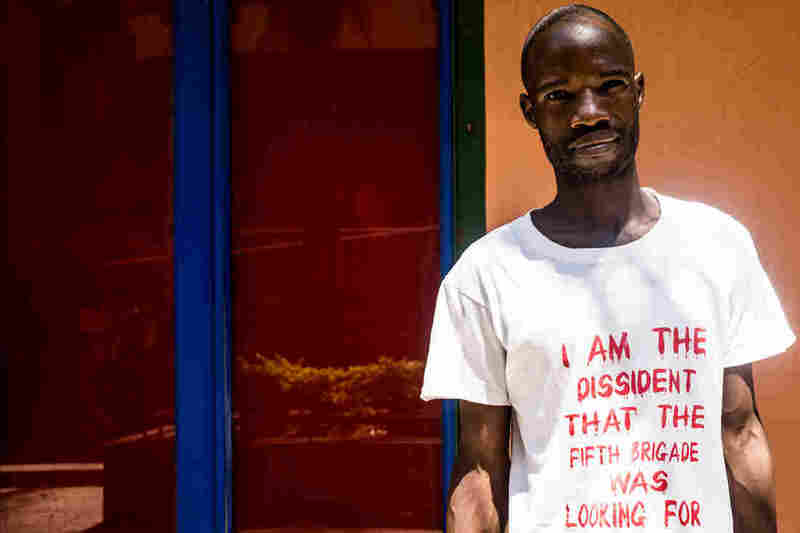 Terrence Mkhwananzi feels trapped and unsafe in what is now regarded as the new Zimbabwe. Bailed out from remand prison, the 32-year-old activist makes weekly visits to the police station while state prosecutors deliberate over a date to start his court hearing. He's on trial for pointing at a presidential portrait at a public hearing in the city of Bulawayo. In front of the Commission of Inquiry, an independent body mandated to investigate the Aug. 1 post-election violence, Mkhwananzi accused President Emmerson Mnangagwa of being responsible for his father's death. A year since Mnangagwa seized power from his former mentor Robert Mugabe, and declared the beginning of a new era of freedom, it is still a crime in Zimbabwe to criticize the head of state. Mkhwananzi says his father was killed in December 1986 during ethnic massacres in the southern and western parts of the country. 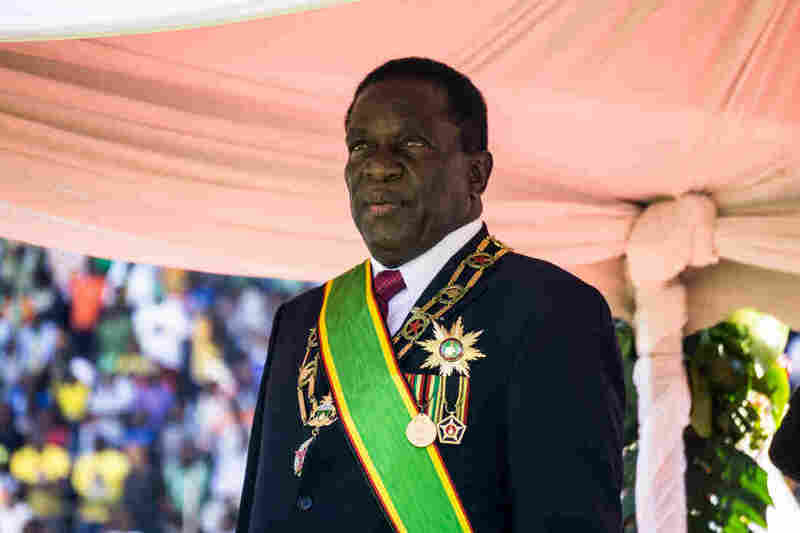 As minister of state security at time, the country's new leader Mnangagwa is accused by the opposition and local activists of being complicit in the North Korean-trained Fifth Brigade operation in the 1980s, which killed at least 20,000 civilians living in the Midlands and the Matabeleland North and South provinces. Terrence Mkhwananzi was charged with insulting Zimbabwe's President Emmerson Mnangagwa after he accused the former minister of state security of killing his father. Mkhwananzi is a member of the Mthwakazi Republic Party, an emerging movement that advocates for the southern and western regions to secede from Zimbabwe for historical reasons and unresolved grievances from the ethnic killings in the 1980s. He says the government is denying him the right to expression. In many ways, he says, the country feels even less democratic under Mugabe's successor. "Mnangagwa came in promising us a change. At least with Mugabe, we always knew that he was brutal, he didn't come in pretending to be nice to people. But with Mnangagwa there is no democracy in this country," Mkhwananzi tells NPR. "It cannot be an insult to talk about something that hurts our family so much. All we know is that my father was killed along with many others from the village, but we don't even know where he is buried." In theory, the country's Constitution guarantees the right to freedom of expression. But under a section of Zimbabwe's criminal law, it is an offense to insult the office of the president. This means jokes, slurs or accusations against the head of state are unlawful and an "insult" carries a hefty fine and a brief stint in jail. If other charges are included, sentences can be longer. In 2013, the Supreme Court found the insult law to be invalid. Mnangagwa, who was justice minister at the time, appealed against the decision and defended the law. A case for the insult law to be struck from the statute books was lodged five years ago, but it remains in force because it hasn't been heard by the Constitutional Court. Lizwe Jamela, the programs director of Zimbabwe Lawyers for Human Rights, which routinely handles insult cases pro-bono, says it is a very chilling sign that a repressive law still continues under new leadership. The legislation was inherited from the British colonial era, which lasted from the 1880s to 1965, and took its current form in the early 2000s. On the eve of Zimbabwe's first election without him on the ballot, former President Robert Mugabe addresses the press at his home. 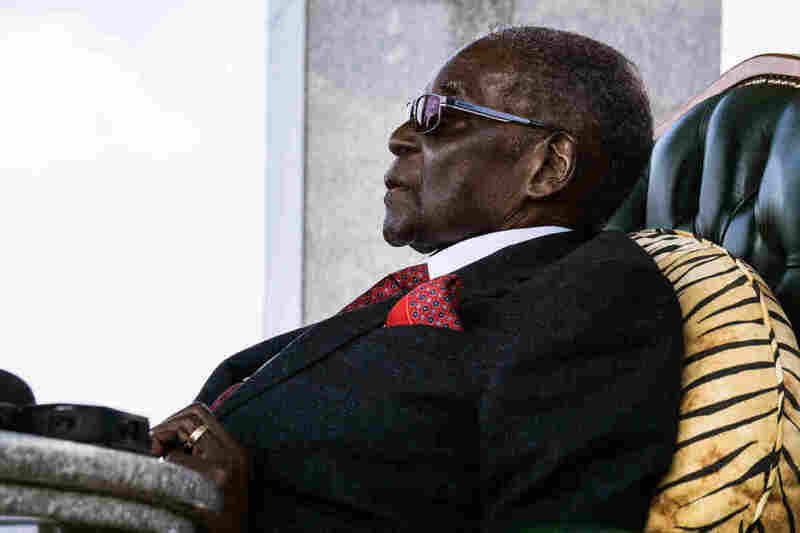 "It sends jitters down the spine that this law continues to be used because, during the First Republic of Mugabe, this law was abused and used against those perceived to be political enemies or voices of dissent," he says in a phone interview. During Mugabe's 37-year rule, hundreds of people were accused of disparaging the president through art, protest or simply calling the veteran dictator "old," or a "goblin." Shortly before Mugabe's fall in November 2017, Martha O'Donovan, a U.S. citizen working in Zimbabwe, was jailed on charges of subversion and allegedly tweeting under a pseudonym that Mugabe was a "selfish and sick man." She denied the accusation. After months of postponed hearings, the charges were dismissed due to lack of evidence. However, since Mnangagwa narrowly won the presidency in a disputed vote on July 30, up to a dozen people have been arrested under the insult law, according to information from the human rights lawyers group. Despite Mnangagwa's inaugural promise to lead Zimbabwe on a "path full of freedoms, democracy, transparency, love and harmony," the new administration seems to be showing an intolerance of criticism similar to Mugabe's dictatorship. Just days before Mnangagwa's inauguration on Aug. 26, activist Munyaradzi Shoko was charged with criminal nuisance for a Facebook post in which allegedly said that Mnangagwa is associated with "evil and devilish deeds." According to the Zimbabwean human rights lawyers' group, which represented Shoko, he was hauled before the courts and Shoko did not plead. The charges were later dropped after the lawyers claimed their client was assaulted by police while in custody. Jeffrey Smith, executive director of Vanguard Africa, a pro-democracy organization that engages with African governments, says he is not surprised by the insult law arrests. Mnangagwa — nicknamed the Crocodile for his crafty ways as a liberation fighter — rose to power through a de facto coup. Smith believes it would be a mistake to assume the country will now become more democratic. "As many activists and onlookers rightly anticipated, dissent and criticism continue to be criminalized in Zimbabwe, and that is a situation unlikely to change. That Mnangagwa and the military cabal would usher in and commit to a 'new dispensation' was a farce from the outset," he says. Following decades of Zimbabwe's isolation and targeted sanctions from the West, Mnangagwa has launched a big foreign investment drive to help the cash-strapped nation get back on its feet. His mantra "Zimbabwe is open for business" is yet to bear fruit, but rights lawyer Jamela says in order to attract international investors, it is critical to make fundamental changes to the African nation's repressive laws. "You can't say Zimbabwe is open for business, when it is not open to freedom of expression," Jamela remarks. 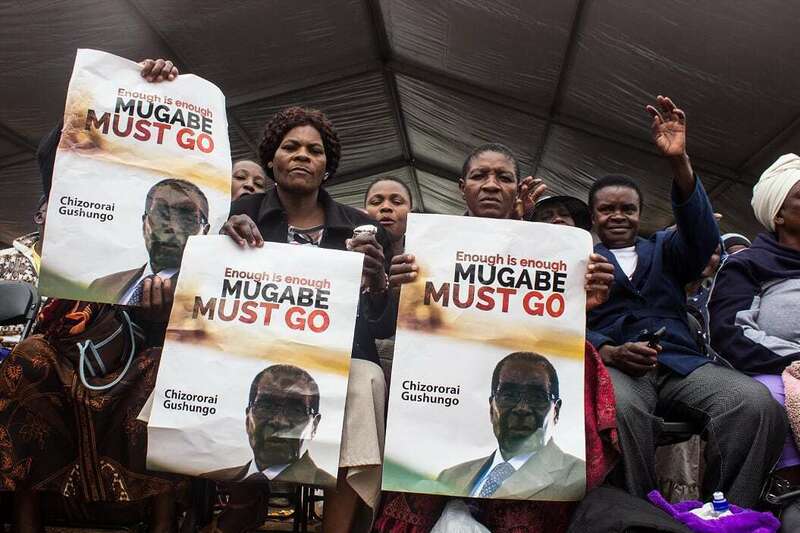 Female war veterans from the liberation struggle hold up placards urging Mugabe to step down during a mass march that saw tens of thousands protest in November 2017. This week, the Commission of Inquiry issued a report finding soldiers and police used excessive force in the August protests. At least six people were shot dead and dozens injured by security forces. In September, the U.S. renewed targeted sanctions against Zimbabwe urging the new leadership to show definitive steps toward democratic reform. "As long as [Mnangagwa] continues in the mold of Mugabe, frustrations among citizens will rightly continue to rise, the economy will continue to deteriorate, and the country will remain devoid of the leadership it both needs and deserves," Smith says. Tendai Marima is freelance journalist and researcher based in Zimbabwe covering sub-Saharan Africa. Follow her on Twitter and Instagram @i_amten.